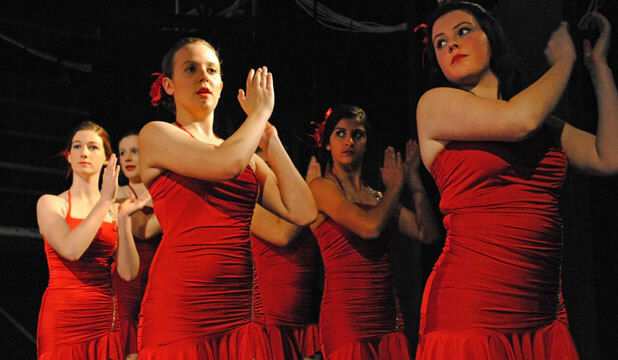 RED HOT: Freyberg High School pupils rehearse the tango scene from 1980s musical Fame. After months of learning lines, dance moves, designing stage, set and lighting, Freyberg High School pupils will get their shot at Fame as they recreate the 1980s hit musical on stage. Teacher and head of music Roger Buchanan said the cast of 65 had been rehearsing for the production since January, and were excitedly looking forward to opening night tomorrow. A further 20 people would be making sure everything went as planned from behind the scenes. The musical, which tells the story of several students attending the High School of Performing Arts, was an ideal choice for pupils, given its school-based setting, Buchanan said. The musical documents the successes and tribulations that colour the students' journeys to the top, and demonstrates that determination can lead to greatness. Audiences could expect a lot of "lively and energetic" 80s music and dance, as well as an array of costumes. Tickets for the show, which runs from May 27-31, are available at the school office, or at the door.